← First two WTO Panels Against Russia — Now What? Busy Summer for WTO Trade Cases — Especially for the US & Other Major Countries — Why? This summer has been extremely busy for litigation before the WTO disputes resolution system. Why is that? Just look at a sampling of cases ranging from those brought by and against the Russian Federation, by and against the United States and China, by and against the US and the EU, as well as other including cases by India and Korea concerning the US. They indicate the nature of the parties involved. 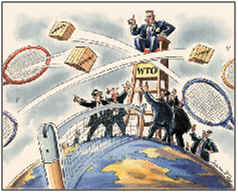 And the critical importance of WTO litigation to trade and foreign policy today. To me the reason for such increase in volume of litigation involving billions of dollars of trade is because the WTO remains the premier forum for settling and litigating state-state trade disputes. Also because of its great success. These recent disputes have involved the largest countries such as the US, China, India and Russia, among others. And as global trade grows, with newer members, the number of transactions grow. It is only natural that more commercial friction will arise and thus more trade cases. But this is natural. More transactions, more friction, more cases. It isn’t the absence of cases but the way they are resolved that marks the success of the global trading system and its resolution system under the WTO. This has all been done peacefully within a global institutional framework that has provided a model of global governance in this ever-expanding field. That’s good for everybody. US Case against China as to export duties. (July 13, 2016). WTO and Russia. (August 21, 2016). Decision Against US on Korean Washers. (Sept. 7, 2016). India Files Case Against US for State Subsidies. (Sept. 9, 2016). US Files Case against China over Agricultural Subsidies. (Sept. 14, 2016). Compliance Panel against EU over Airbus. (Sept. 22, 2016).